A jury has been shown CCTV footage of the moment a woman was shot dead by a police marksman in Sevenoaks. 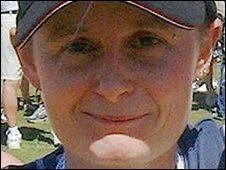 Ann Sanderson, 37, died from a single gunshot wound to the chest during a stand-off with officers in June 2007. The inquest jury was shown footage of Ms Sanderson in a department store car park aiming what was thought to be a handgun at the cameras. Ms Sanderson, known as Tosh to friends, is thought to be the first woman shot dead by UK police for nearly 27 years. The Gravesend inquest heard Ms Sanderson was known to police for a number of offences including arson, criminal damage and possessing an offensive weapon. Jurors heard that when Ms Sanderson had been arrested four years previously for arson, officers found a diary in her home in which she said she wanted to kill a policeman. After her death, police found a note she had written in which said she had a story plotted in her head about being shot dead. On the night of her death, she was seen on CCTV wandering around the car park, aiming what was thought to be a handgun at the cameras. Ms Sanderson, a store supervisor of Bethel Road, Sevenoaks, could be seen trying to set fire to several commercial wheelie bins. She was also filmed sticking her middle finger up to the cameras several times and appeared to swallow pills, before passing out for 45 minutes. Throughout the film, jurors heard recordings of a phone conversation between a member of staff in the council CCTV centre and Kent Police. Council worker Patricia Parselle, who was monitoring the CCTV that night, said: "The thing is with Ann, I've watched her for years and I've never seen her like this. "She's definitely pointing what appears to be a handgun at the cameras." Counsel to the inquiry Catherine Milson said that following Ms Parselle's call to police, an armed response unit was sent to the scene. CCTV footage showed two armed response vehicles arriving and an officer calling out to Ms Sanderson to drop her weapon, but she responded by swearing. Ms Milson said: "It was about then that she aimed her handgun at officers. "You will hear from the officers that they felt under threat of immediate danger. Officer A fired one bullet at Ms Sanderson." Jurors watched as Ms Sanderson fell out of view. Ms Milson said that after a few seconds the officers approached her and tried to give her first aid but she was pronounced dead shortly afterwards. The inquest was adjourned until Tuesday.